16" x 16" 20" x 16" 18" x 16"
Ease of use and instant comfort –that’s the promise of the new Retroback from The ROHO Group. This unique new back support system simply clips to the existing sling upholstery to improve comfort and support posture. Remove the Retroback by simply lifting it off the upholstery. No tools or hardware required! The simple yet functional design provides rigidity to compensate for sagging sling wheelchair back upholstery, while increasing sitting tolerance and reducing lower back fatigue. The quality and innovation you expect from ROHO – at an affordable price. Most back supports require that you remove the existing upholstery and replace it with a solid back support through the use of tools and mounting hardware. Not the case with Retroback. Simply clip Retroback onto the existing sling upholstery and lift it off every time a wheelchair needs to be folded or stored. 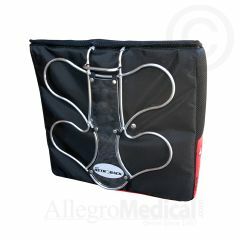 This rugged back support system weighs only 3 pounds, making it easy to attach and remove from a wheelchair. The removable, water-resistant cover is made of a flexible, durable, washable fabric. Retroback also provides support and comfort with only minor compromise to seat depth since the back support is positioned between the wheelchair back posts. ROHO’s Retroback complements a wide assortment of ROHO cushions. Includes:Cushioned back support pad with attachment clip, cover, and instruction manual. Construction: Chrome plated steel clip; water-resistant, polyester/nylon cover. Sizes: Models available to fit wheelchair heights 16" (41cm) to 18" (46cm) and a range of chair widths 15" (38cm) to 20" (51cm). Weight: Approx. 3 lbs. * (1 kg) based on 18" (46cm) wide back. *Varies by size. Retro16C - 16" x 16"
Retro20C - 20" x 16"
Retro18C - 18" x 16"